Here's another batch of picture books for the Picture Book Reading Challenge hosted by Becky's Book Reviews. These are my choices for #6 a book set at the beach, in the ocean, or by a lake (The Beach Before Breakfast), #23 a book by Jon Scieszka (The Frog Prince Continued), #24 a book featured on Reading Rainbow (Knots on a Counting Rope), and #32 a book about starting school (Wemberly Worried). 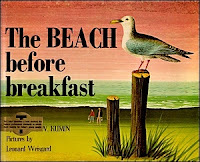 The Beach Before Breakfast is very wordy and very poetic, and though Miss Muffet sat through it, and it was a pleasure to read aloud, I'm not sure she got much out of it. Weisgard's illustrations were the main appeal for me, and since neither I nor my kids have ever been to a beach, this seemed like a good way to introduce the experience. Personally, though, I think McCloskey's Time of Wonder and One Morning in Maine do a better job of conveying a similar summertime mood. This is a humorous fractured fairy tale telling what life is like for the frog prince and his bride following their wedding. Jon Scieszka isn't really an author whose work I particularly like, so this book was really just okay for me. 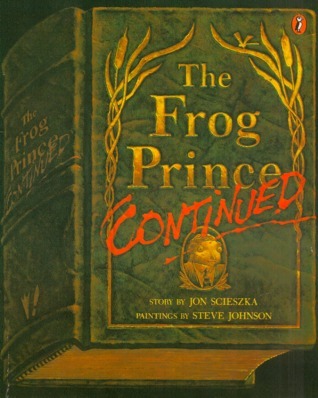 I like the structure of the story, as it has the repetition of form that is common to many fairy tales, but I'm not crazy about the artwork, and I don't feel compelled to share it with my kids even after they get to know the original tale. 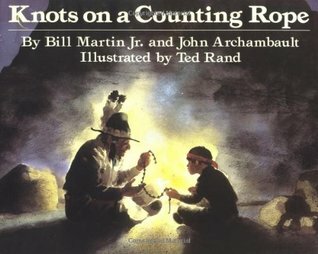 It's the kind of book that I would have used with first and second grade class visits in the library, particularly with groups that were hard to engage, but it's not something I personally need to have in my own collection. This is a book I always see at libraries and book sales but had never read until now. An American Indian grandfather relates to his grandson the story of the boy's life, in which it is revealed that the boy is blind. I thought it was a poignant inter-generational story, but many other reviewers have been quick to tear it apart for its apparent inaccurate portrayal of American Indian culture. I liked both the style of writing which was very poetic and the use of light and shadow in the illustrations, but probably not enough to want to own a copy. I did think it was interesting that this is the exact same trio that created Here Are My Hands, but the two books are totally different. Miss Muffet is on a Henkes kick, so we've been reading and re-reading his mouse books. 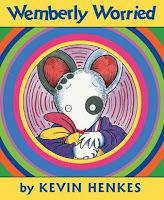 This one is not quite as clever as some of the others (namely the Lilly books) but Miss Muffet has obviously been thinking about it because out of the blue one day, she said, "I am a brave child. Wemberly worries a lot, but I never worry." It reminded me of the time a parent in the library told me she would never read this book to her child because it would introduce the concept of anxiety and cause her to become fearful. Clearly this was not the case with my daughter - for her, it simply reinforced her own resilience. Henkes really is the best at empathizing with preschool emotions and describing them in a relatable way. And though we don't intend to send our kids to school, Henkes is also very good at reassuring kids with anxiety surrounding that transition.